An article about my search for the maritime history of the Tamils which appeared in The New Sunday Express. It was my curiosity about the ancient Tamils' maritime history that led me to the temple of Azhagiya Nambi at Thirukurungudi. 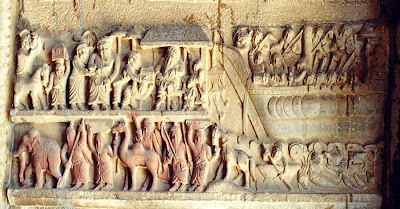 I had heard from a Tamil scholar that the temple had a sculpture with a carving of a ship. It was sufficient to whet my curiosity. So on a trip to Tirunelveli, I decided to steal some time from my assignments and head for Thirukurungudi, about 47 km south of Tirunelveli. With the Kalakkad ranges of the Western Ghats forming the backdrop and the river Nambi, a tributary of the Tamiraparani, coursing through the village, Azhagiya Nambi's temple, one of the 108 divya desams of the Vaishnavites, is set in the most scenic of surroundings. The unfinished gopuram over the entrance is majestic, with a wealth of sculptural detail. Right on top of the roof, at regular intervals, are monkeys sculpted in various poses, as if frozen in stone whilst busy in some activity. After scanning all sides of the gopuram for the engraving of the ship, I moved into the temple only to be overwhelmed by more-than-life-size sculptures, looking as though they were about to leap upon the visitor. For those who have visited Krishnapuram near Tirunelveli or the Patteeswaraswamy temple at Perur near Coimbatore, the hall leading to Azhagiya Nambi is equally grand. With just one roll of film and very little time on my hands, I was totally unprepared for the spell-binding visual onslaught. I reminded myself of the purpose of my visit and moved further inwards, past an exquisite Rathi Mandapam. By then, I realised that this was a huge temple complex, embellished throughout with beautiful sculptures, and that I would require local help to locate the ship. I decided to buttonhole an old man, an Iyengar, who was resting near on the second entrance. He casually waved his hands above, pointing to a panel right opposite him. There it was, almost 10 feet above us, a very detailed bas-relief sculpture of a ship about to anchor, with a boat beneath it heading towards the shore. Right on the shore was a horse being led by a man, and they seemed to be part of a grand procession of men and animals loaded with goods. The men in the panel seemed to be Arabs with broad, bearded faces and wearing caps. It seemed to be a record of the more than 2000 years old Arab trade contacts with Tamil Nadu. I was amused that these pious-looking Arab traders should be sitting above the second entrance to Nambi. Perhaps in those days religion was relatively a non-issue. The panel also vaguely reminded me of a sculpture of Arabs I had seen in the ruins of Hampi. I had never expected to see such a detailed panel so far down South, by the foothills of the Western Ghats. But then, Thirukurungudi is closer to the ancient seaports of Tamils. Even closer, just a few km away, is Eruvadi, a small town with a predominant proportion of Tamil Muslims. Buried in this town are some great merchants and seafarers from Kayalpattnam, again an ancient port town. Wishing to photograph the panel, I went in search of the manager, Thiru Narayanan, who proved to be very helpful. He arranged for a ladder to be brought so that I could photograph the panel without any distortion. This was not the only panel. Right above and opposite it were panels describing scenes of war and, apparently, scenes from Puranas. Above me on the ceiling, along with a lotus pond, was a procession of musicians and women, their bodies turned towards the Gajalakshmi, a symbol that one comes across in temples built by Nayaks and the rulers of Vijaynagar. After exhausting my roll of film, I reluctantly got off the ladder, curious to know more about the builders of this great temple. The sthala purana handed over to me spoke about its association with Sri Ramanujar and the Alwars. Unfortunately it did not have any information on the builders of this great temple. However, it did have an interesting story to tell, that of Nampaaduvaan, a devotee born of lower caste (Paanars) and hence denied entry into the temple. According to the story, on an ekadasi day, while Nampaaduvaan was on his way to the temple to worship Nambi, he was confronted by a hungry demon who wanted Nampaaduvaan for his next meal. While Nampaaduvaan was willing to be the prey, he had just one request — to be allowed to conclude his ekadasi fast in front of Nambi at the temple. After expressing some doubts, the demon relented. Nampaaduvaan's heart-rending hymns sung in praise of Nambi in Kasiski Raga pleased the Lord, and he granted his devotee the moksha he wanted. And how? Azhagiya Nambi gave darshan to the untouchable devotee who had been denied entry into the temple by moving the Kodi Maram, which had been obstructing the view. It reminded me of a parallel story in the Shaivite tradition, where Nataraja gave darshan to an ardent devotee from a lower caste, Nandhanar, by moving the Nandhi that similarly obstructed the view at Chidambaram. A drama based on Nampaaduvaan has been revived, informed Thiru Narayanan, and I realised that this was the Kaisiki Natakam. Danseuse Anita Ratnam, with the help of Professor Ramanujam, was involved in reviving it as an annual event during Ekadasi at Thirukurungudi. Incidentally, Thirukurungudi is also the birthplace of the legendary TV Sundaram Iyengar, founder of the TVS group. With time running short, I left the temple without even getting a look at the wooden sculptures on the vimana and also Azhgiya Nambi. I knew for sure that I would be coming back, Inshallah, with a lot more time in my hands. For there seemed to be lot more to Thirukurungudi, not just for the spiritually inclined but also for connoisseurs of art and social historians.